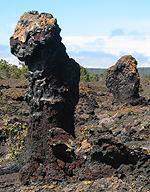 Lava Trees can be found in several locations on the Big Island including Lava Tree Park in Puna and Pu'u Huluhulu up in the Hawai'i Volcanoes National Park. 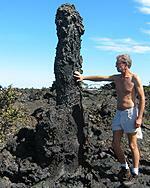 However, no other location rivals the quality of the lava trees you will see on this hike. 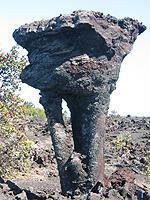 Besides lava trees this hike also offers you a fantastic and rare view of Keanakakoi Crater. Walk to the trail where it crosses the road and walk across the road (to the right of the pullout) to the trail sign. This is a segment of the Crater Rim Trail. This hike is about a mile long loop that deposits you back along the road a bit from your car. The first third of this walk is extremely level over a shaded dirt and gravel path. 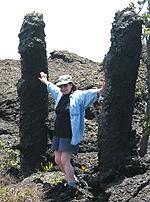 The second third of this hike takes you out from the tree cover and up over pahoehoe lava. The lava is fairly level with some small ups and downs. 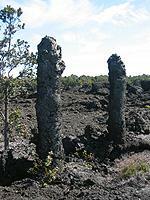 You will go to Keanakakoi Crater and then backtrack to the lava trees. The final third of the trail is through the lava trees. 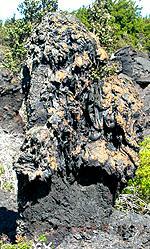 The footing varies from fairly smooth pahoehoe to rougher or broken lava. You will have to jump over very small fissures (easy) from time to time and climb up and down small lava hills. All in all this is a pretty easy hike. We do the hike in slipahs but you might prefer sneakers or boots to keep from getting nicked by the lava. Sunscreen will help keep you from getting burned as you enjoy the many lava trees. Don't forget water and a camera. 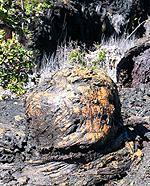 Portions of this trail go over pahoehoe lava. The lava varies from fairly smooth to somewhat broken. The terrain is relatively flat but you will have to go up and down small hills in some places. The Keanakakoi Crater has no railing or anything else to break a fall should you stray too near. The very edge may be prone to breakage so standing a bit back is advised. If you brought children on this hike, keep them close by while you enjoy the crater. Under no conditions should you do this trail if it is dark, or if vision is obscured due to fog or other conditions. The start of this trail is on the opposite side of the road as the pullout (the pullout is on the left, as you are heading down Chain of Craters Road, and the trail is on the right just past the pullout). Cross the road and walk to the trail and the sign at the start of the trail. This hike is divided into thirds. The first third of the hike is spent walking along a very easy pathway. The path is mostly small gravel and dirt and skirts a lava flow on the left as it weaves in and out of the 'Ōhi'a trees, Pūkiawe, 'Ōhelo berries, and other native plants. This is nice and shady and easy going and offers a good time to think about this area and what we will see. 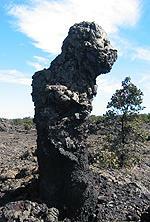 The crater, lava, and lava trees in this area are all tied together in an unusual fashion. The Keanakakoi Crater, our first stop on this hike, and surrounding area has been extensively studied due to the fact that it produced an unusual ash formation called Keanakakoi Ash. This formation has been studied not only for understanding of other volcanic events around the world, but also as part of the Mars Rover mission for possible volcanic signatures on Mars. The ash formation in this area was produced from a series of explosive eruptions of the Kilauea volcano starting around 1500 AD and ending with the most recent explosive eruption around 1790. 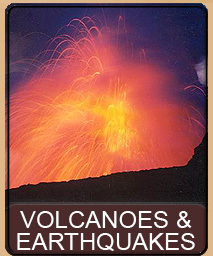 The Hawaiian volcanoes are not usually explosive - but in this particular area the crater was thought to have been below ground water level and a small lake may have formed on the crater floor. Magma entering the lake would cause a huge explosion of blasted lava and steam to be ejected high into the air at over 100 mph. 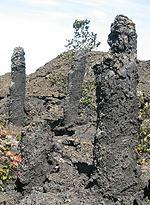 The lava trees themselves were produced from lava flows between 1971 and 1974, some of which fountained from fissures near the Keanakakoi crater, coating the trees with the falling lava and ash. By now you have reached the end of the tree lined path and the path now takes you up and onto the 1974 pahoehoe lava flow. After a few steps one of the first things you will see are some lava trees to your left. 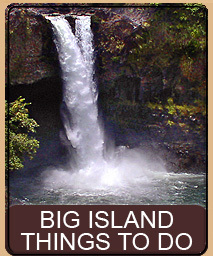 Ignore these if you can (we are coming back to them later), and continue on the trail past the lava trees. 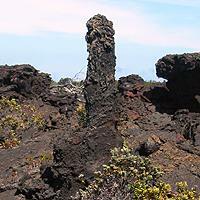 The trail will meander a bit towards your right and you will encounter a bit rougher lava surface. 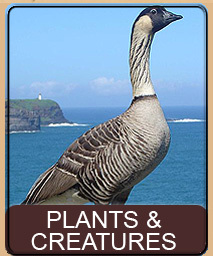 After about 100 to 150 yards you will be near the Keanakakoi crater. You will see a pig fence, built to keep wild pigs out of protected areas and the crater itself. Be careful here because the crater edge is brittle and could easily fall in. Keanakakoi crater is 115 feet deep and 1,500 feet wide. It is originally a pit crater meaning that it was not formed by lava but instead was produced by the magma below the ground suddenly draining out causing the ground to drop and form a pit. Another great example of a pit crater is the nearby Devil's Throat Walk. Many pit craters have a lava tube at the base - part of what drained the magma. The rocks in the lava tube in Keanakakoi were used by the ancient Hawaiians to make stone tools. The name Keanakakoi literally means "Place of the Adze". However, the 1971 and 1974 lava flows entered the crater and covered the crater floor as well as the lava tube and Adze quarry. Six combined photos make this panorama of Keanakakoi Crater. Keanakakoi crater is also viewable from Crater Rim Drive. Where you are standing now, looking across, is the visitor overlook to the crater. You will probably see people pull up and take pictures and drive on. You will be tiny dots in those pictures standing on the opposite rim of the crater. 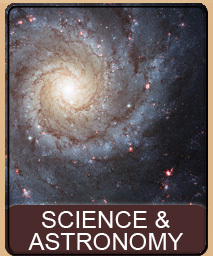 If you look carefully at the ground around you here, you will see that it is composed of very small pieces of lava - ranging from ash to pieces as large as a quarter. 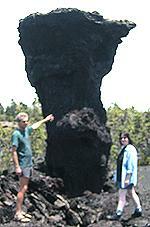 This is the fallout from fountains of lava, and also part of the Keanakakoi Ash layer. Walk a bit to the right of the Keanakakoi Crater sign, right of the crater, and you will find this fallout of lava is a bit smaller. Crouch down and gently look through the pieces. You are looking for a type of lava known as Pele's Tears. 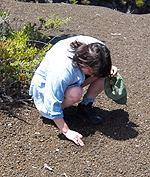 Pele's Tears are bits of lava that are round or tear shaped. The more perfectly tear shaped or round, the better. 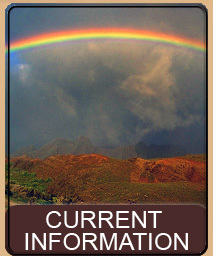 Pele's Tears are formed when lava is ejected high into the air. The energy of the ejection causes the lava to break apart into smaller pieces which, as they tumble to earth cool. By the time they hit the ground they have cooled enough not to change shape and end up as round, oval or tear shaped pieces. 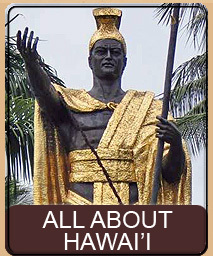 Do remember though that you are only looking at Pele's Tears as it is against the law to take any lava from the park. You can find wonderful examples of Pele's Tears throughout the park, but especially on this side of the Kilauea Caldera as the wind brought the fallout to this area in most of the eruptions. Now on to the lava trees, to get to the lava trees we retrace our footsteps away from Keanakakoi crater and back to where we first saw the lava trees we told you to ignore. This is the start of the lava tree field, which extends from where you are, all the way to the road you parked on. As long as you keep the tree line on your left and the crater behind you, you will be walking towards the road and through the lava trees. Note that there is no actual trail from this point on. 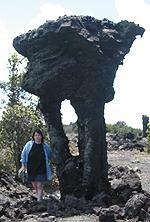 As we said before, the lava trees in this area are some of the best examples of lava trees anywhere on the island. Since the trees were created in the 1971 through 1974 lava flows and fountains they are fairly new and you will still be able to see actual burnt wood in some of the trees. Likewise, the trees have had little time to decay and crumble or generate much in the way of plant growth. One of the first trees you saw (and ignored), after you left the tree line kind of looks to us like a giant bust of George Washington. You will note that in many of the trees, various faces, ice cream cones, and of course, the always present phallic imagery that these strange formations produce. Ok, so meander through the lava field. Basically, starting at the first lava trees you saw just walk back towards the road keeping more to your left than your right. Just because you don't see trees ahead does not mean that just over the next hill there won't be a huge grouping - there are literally hundreds of lava trees between you and the road. Save some of your film because some of the best trees are further in the field. Most of the trees, you will note, have a very smooth texture and almost look like they were splashed - and of course they were, from fountains of lava. In some of the formations the trees have partially fallen over, making for rocks with holes, triangles and squares going through them. 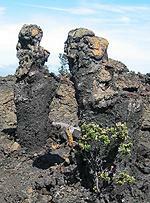 Other places have groupings of trees tied together at the top by a common platform of lava. You can imagine the lava falling from fountains, setting the trees on fire as they coat them. The trees you walked through in the first third of the hike were part of the same forest that was destroyed by the lava. Think what it would have been like to get caught in the forest during the fountaining lava. As you near the middle of the lava tree field you will notice that many of the trees look as if they have thrust up through the ground. 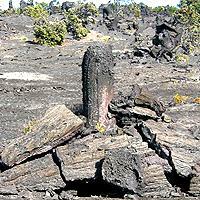 The ground is all broken around them and the rocks are broken upward with the lava tree thrusting out of the middle. It is as if a lava tree had suddenly broken through the ground in front of you, thrusting up violently like in some awful science fiction movie. 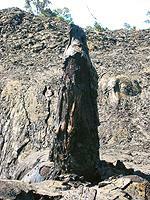 What actually happened was not a thrusting up of the lava tree, but a settling of the earth around the tree. As the earth settled a foot or two downwards, the ground around the tree stayed stuck and broke and slanted. But the effect is to really make you believe that it was the other way around. Many of the trees are huge - bigger than two or three people. Other trees were very small, only knee high. Some of the trees you will notice are hollow and you can look in them as well as examine the imprint of the bark of the original tree on the inside of the lava. 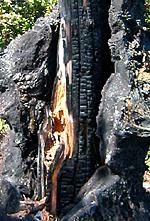 A few trees will still have their burnt wood in the lava - an excellent way to see exactly how the process occurred. As you progress through the field, with the tree line to your left, you will eventually go through most of the lava trees and into some rougher lava. It is hillier here and a bit of scrambling will lead you to a small vent, which is one of the vents responsible for the ash and the lava that coated the trees. Keep going from that point, along the tree line and you will come out on the road. Your car is a short ways back along the road to your left. This page is named 'Hikes.htree'. Can't Find It?